Easy to set up and for holding seamless paper, canvas, muslin and other you need. As well as perfectly use for photo/video studio shooting, home, outdoors and on-site. Come with a heavy duty carry bag, makes this item more portable. heavy duty, sturdy, durable, stable, safe and other you expected. Double spring cushioned design for safety use - similar to Air Cushioned. Holds seamless paper, canvas, muslin and other backdrops you need. 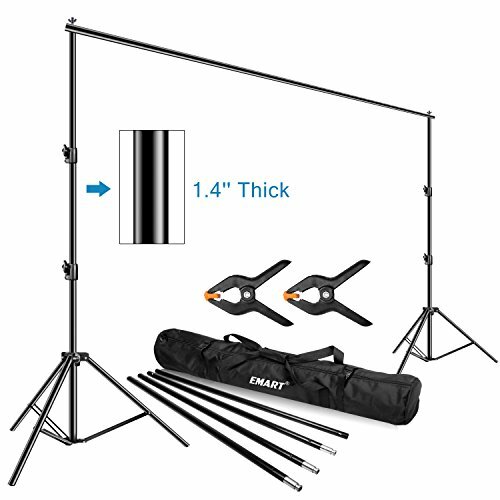 Professional heavy duty photo backdrop stand kit, 1.4'' diameter tube - more sturdy & durable, perfect for using at home, studio or outdoor. (2) x Support Stand built-in Dual Spring Cushion: height adjustable (Min 3.7ft - Max 10ft), made of 100% Aluminum material, stable and no wobbly even though outdoor use. (4) x Crossbar: width adjustable (Min 6ft - Max 12ft), easy to connect, no sag when hang backdrops within 35 lbs, safety use. If you have any questions about this product by EMART, contact us by completing and submitting the form below. If you are looking for a specif part number, please include it with your message.